Left to right: Olivia Fogle, Brithney Campbell, Denise Warburton, Kristina Linder prepare for the Diversity Ball. Transportation was provided by BSU beginning at 6:30 p.m. from Dansbury Commons and the circle at the University Ridge. This occurred for every 15 minutes until 8:30 p.m.
With an admission fee of five dollars, people slowly arrived at the dance. Girls could be seen wearing long or knee-length dresses whereas guys wore either a suit or dress pants. A vast majority of them wore an assortment of shoes and accessories. In one corner, Christmas lights hung amongst a board, allowing students a place to take photos. Red roses were also placed on every table. Throughout the night, students danced to music played by DJ Quincy Hale Palmer. These dances alternated depending on the songs played. Frequently, students were influenced to dance in small groups with their friends. “The DJ was great, although some of his songs were not the kind to dance to,” said senior Olivia Fogle. Some students became more motivated towards the music, performing dance moves that captured everyone’s attention. During these times, students gathered around in a circle to watch. Eventually, girls threw off their high heels and placed them aside to get the full enjoyment out of dancing. When students weren’t dancing, they lounged on the seats or outside of the room. Moreover, food and refreshments were available by Aramark. “I enjoyed spending time with my friends, getting dressed up and seeing everyone have a good time,” said senior Brithney Campbell. “It is a fun and interactive event that embraces all people with a giving of equal access and opportunity to have fun together,” said junior Rebecca Aduclasse. “I enjoyed the food and the event. 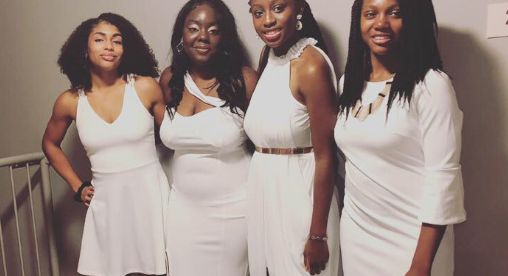 Although it was difficult to find a dress, I believe the “All White Affair” concept was an interesting idea that made the ball unique this year,” said Fogle.